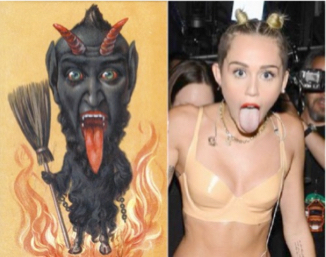 Miley Cyrus left her followers shocked and confused after advising her young fans to “worship Satan” if they want to become “rich & famous” like their heroes.The former Hannah Montana star left a group of fans bewildered after passing on the “pearls of wisdom” when asked for tips on how to gain success in the entertainment industry. This statement indicates that followers, known as Thelemites, should seek out their true path in life, and follow their “True Will.” Jay-Z’s Satanic preaching is just the latest in a long line of public glimpses into the dark side that the rapper has shared. He recreated his image as a dark lord, after starting his career as an aspirational rapper, flashing Illuminati hand gestures and promoting Satanic symbolism as he rose to the top of the music industry. Jay-Z has since attempted to tone down his dark image since establishing himself in the global consciousness as a Devil-worshipping entertainer.